Saucony’s new Peregrine ISO will help you blaze your own trail! For those of you looking for the latest in comfort and cushioning in a shoe that will withstand the elements, check out the new Saucony Peregrine ISO! 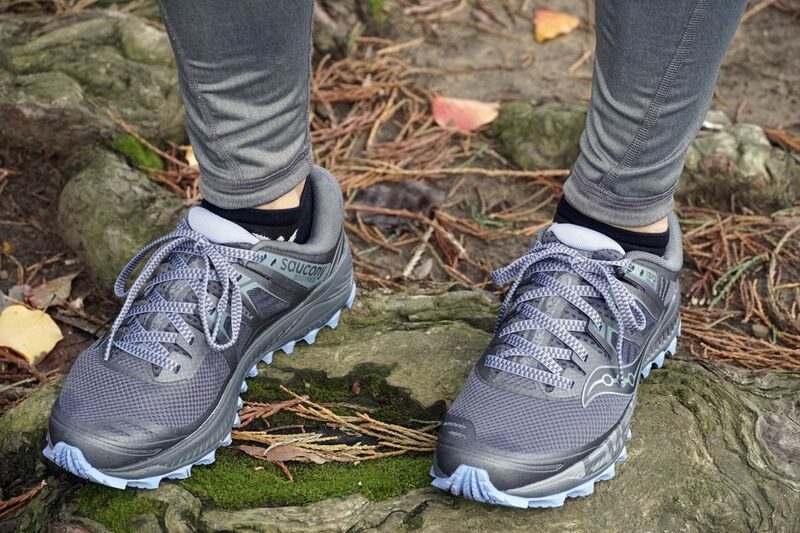 With its reliably deep and sturdy tread and its updated mold-to-your-foot upper, you’ll feel secure and light-footed as you race down or tread up those mountain trails on your next run. Saucony’s ISO fit offers an adaptable feel, with a snug-fitting upper for a seriously close grip combined with wings that surround your foot and attach to the laces. You’ll appreciate those wings after a long run when your foot’s swollen up a bit more than normal! Despite the snug fit of the upper, those wings will allow the shoe to adapt to your foot as it expands, ensuring the fit never feels tight or restrictive. No need to worry about your shoe fitting any differently at mile one than it does back at the trailhead! So, we’ve got a shoe that can meet the demands of even the toughest trail run — now how do you match it with apparel that can keep up? AND, how do you do it when you’re up a hill and probably won’t have time to do a full outfit change before running your post-run errands? This week, we’re showing you how to transition your look from trail to off-trail by simply switching out ONE piece of clothing — your top. In our trail look, that top is one of our favorites from On’s apparel collection: the Performance-T. Its fast-dry front will leave you protected from the wind and its mesh, pleated back will help keep sweat away from the body, no matter how much sweat you’re working up! 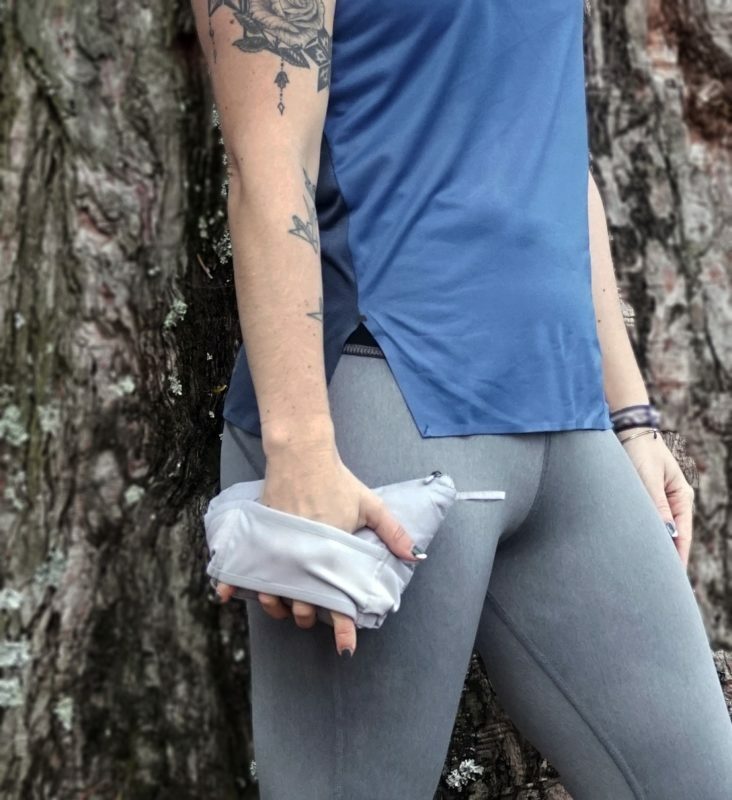 Its laser-cut v-seam sides keep it from riding up on you, even with a high-waisted number like these NUX Reversible Leggings. While we chose to wear this NUX pant with its waist unrolled, you can fold it in on itself for a mid-rise fit without losing any compression. 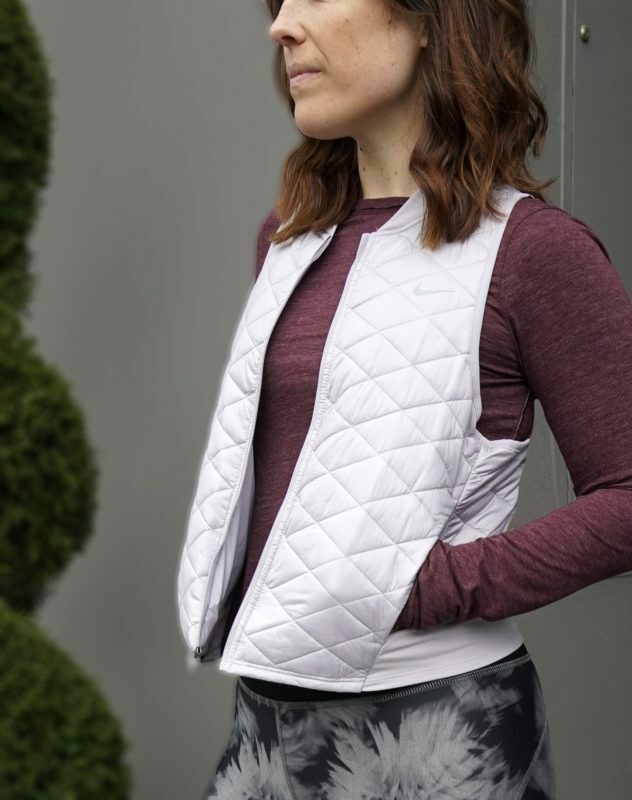 Its reversible print has the bonus of helping to hide sweat marks, so you can work out in the heather grey side, then flip it for a fun, sweat-line masking style like you’ll see in our next look. This Nike Aerolayer Running Vest is maybe our FAVORITE layering option for the trails. Not only does it feature a light, quilted down surface to help fight that nippy wind, but it’s blended with a banded poly-blend waistband so it’ll stay in place and sit comfortably at your waistline. 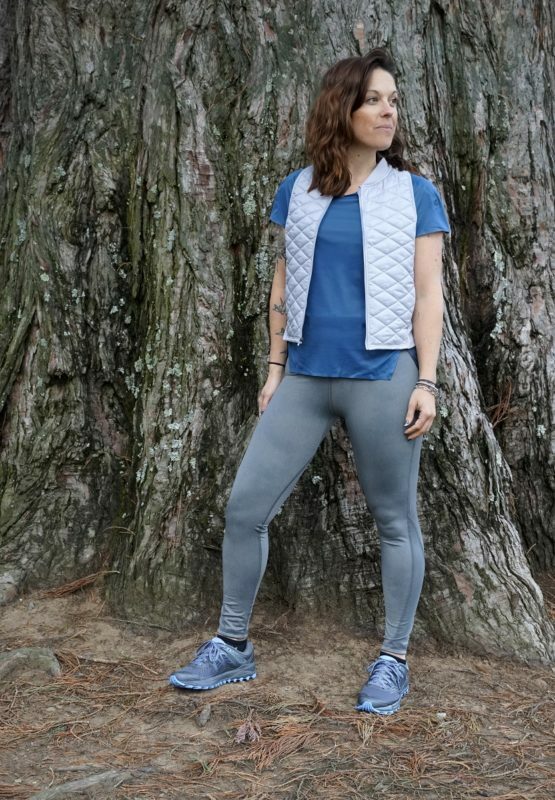 We’ve found that longer vests can sometimes hit us the wrong way at the hips, so this one is especially awesome for our hippier ladies (like me!). In addition, it packs tightly into its own side pocket and transforms into an armband that you can wear while you run. How nifty is that?! …and back to the trailhead! We’ve been in your shoes before: you get out early to sneak in a few silent miles on the trails and lose track of time…only to find that you have a good two or three errands to run on your way home and don’t want to show up to them caked in mud and looking like you literally came out of the wilderness. So how to get this look by only packing ONE piece of apparel in your bag? Here’s how! Vimmia is designing collections with equal amounts of technical fabrics and blended options that will all wick sweat and moisture, but can also be worn to and from a workout — because when’s the last time you saw someone tuck a race singlet into their high-waisted jeans?! We went with the Vimmia Cross-Back Long-sleeved Tee, with its high neckline and thumbhole sleeves to give us a hint of warmth, but with an exposed back so we can rely on our Nike vest to provide some additional moisture wicking. This entry was posted in Armoire Assistant, Gear Up and tagged armoire assistant, nike, nux, on running, saucony, vimmia. Shannon has had that passion for fashion since she could tie her own shoelaces. These laces were covered in glitter and, shockingly, not pink. After 12 years between NY and Chicago, she came to California three years ago to join A Runner's Mind, one of the Top 10 Running Stores in America. 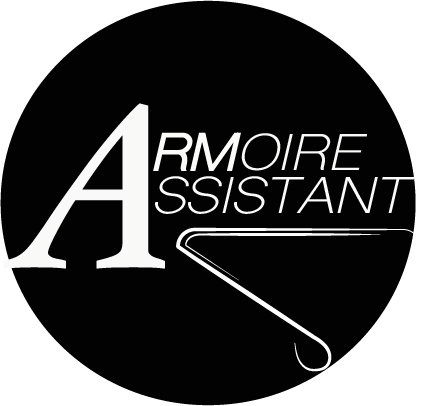 With a firm belief that fashion is the armor to survive everyday life (thank you, Bill Cunningham), Shannon created the Armoire Assistant to create the first digital platform for athleisure, driven by the desire to outfit YOU from workout to work to weekend at the touch of a button.